Gov. 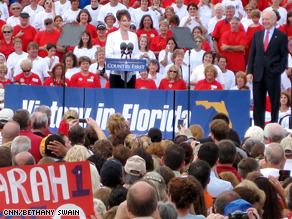 Palin spoke about Obama's ties to Rev. Wright in an interview. (CNN) - Sarah Palin has increasingly embraced the attack dog role on the Republican ticket – but in a new interview, she seems to endorse a line of attack John McCain had distanced himself from earlier this year. The Republican VP nominee told Bill Kristol of the New York Times that Obama's long-time relationship with minister Jeremiah Wright should be a bigger issue on the campaign trail. "I don't know why that association isn't discussed more," she said. "Because those were appalling things that that pastor had said about our great country, and to have sat in the pews for 20 years and listened to that - with, I don't know, a sense of condoning it, I guess, because he didn't get up and leave - to me, that does say something about character," said Palin. ".I guess that would be a John McCain call on whether he wants to bring that up." When the North Carolina Republican Party launched a television ad this spring taking aim at Obama's ties to Wright, McCain first repudiated the attack. "I've said again and again, I do not believe that Sen. Obama shares Rev. Wright's extremist views which he has stated, whether it be the United States Marine Corps or the flag or what," McCain said. "I am leaving that issue to a dialogue between Sen. Obama and American people." He added that all he could do, "in as visible way as possible, is disassociate myself from that kind of campaigning." But McCain soon signaled that he might have changed his position on whether state Republican parties or downballot GOP candidates should exploit the Wright issue in local campaigns, suggesting that he had shifted his stance after Obama told an interviewer that the controversy surrounding his ex-pastor was "a legitimate political issue." "As I said before, I am of the belief that Sen. Obama does not reflect the extremist statements that Rev. Wright has given," McCain told reporters. "I have no comments on it, but I also understand why millions of Americans may, as Sen. Obama said yesterday, view this as a political issue." Still, the issue has not been major fodder on the trail since McCain himself dealt with fallout from the endorsements of headline-grabbing pastors this spring. Reports of controversial statements by evangelical leaders John Hagee and Rod Parsley ultimately led him to reject the backing of both men. After all will the AMERICAN PEOPLE fall for this childish stuff? I am not sure I trust the American people. Where is Biden in all this? He should be Obama's attack dog and call this incompetent ignoramus for what she really, is a lying, clueless, uni-dimensional (insert your favorite Palin noun). All this from a person who in all probability used her governor's position to try to fire her ex brother in law and then when some one stood up to this airhead she fired them. It never fails to amaze the speed in which the GOP abandons issues and resorts to lies and innuendo all the while having a closet full of skeletons. Palin is such trash. She should be ashamed of herself. ignore your bias when it comes to the election. So much for freedom of speech,. More McCain smears. This is disgusting. What gets me is that people don't realize that John McCaine is the unpatriotic one. Everything he is doing now will only undermine the credibility of the presidency if Obama should win. His attacks only serve two purposes...to WIN and to divide the American people. "There is no 'I' in the word Team...but there is in WIN" – John McCaine. You make me sick John McCaine. I hope you lay comfortably at night snuggled in your lies. I am wondering how can 40% something Americans still approve this ticket. Are the polls totally wrong, or the country has become hopeless? As a "Washington outsider" she sure has learned fast. Does that mean her words as a Washington outsider, which was meant to be a positive thing, should not be taken seriously now? It s time for real change. Change that will bring prosperity and peace to our nation. We need the Democrats in the White House. As a nation, we are sick and tired of the GOP 's failed policies that benefit just a few and forget about most of us. The GOP will say anything, they now they have lost the respect of millions who are now facing foreclosure, who are worried about medical bills, college tuition, retirement, and who simply can no longer trust a party that simply benefits the wealthy. Our economy, our safety and prosperity depend on people who truly care about all people. I'm all done with CNN, I've tried all morning to post my Republican retorts but they are only posting Obama trash mouthed posts. CNN is BIASED! Don't expect any representation here Republicans! Boo-Hiss! Sarah – question for you, during the debate you criticized Biden for always looking back – what was it you said? Oh yeah – .....there you go again, looking back. So I ask you, where is your forward looking views? If you are going to "pretend' to be an adult and a "leader", how about talking about policies for a change. Americans need answers and not this "recycling of old news" you seem to only know how to do. While people may view you as being a "tool"of McCain (mouth piece for smearing his opponent), I say tthat thave it wrong – this is who you really are. So sad but true. What is just so ironic about all of this is that had McCain belonged to Rev. Wrights Church and the roles were reversed, it would still be making headlines. You know what Dems...you have had the media in your back pocket the last two Presidential Elections and you still LOST!! According to the "polls" your guy was up 12 points going into the last election...and you STILL LOST! The Silent Majority is NEVER silent on election day. I REJECT OBAMA and HIS LIES. He stands for nothing I beleive in. How does this solve anything? When Obama wins, I had better not hear anyone on the right wondering why. He proposes plans and solutions, McPalin proposes more lies and smears. Are they kidding? Resurrecting Rev. Wright? Well, let's whip out that video of the good Governor being saved from witches and while we're at it, let's delve into Todd the First Dude's secessionist ties AND don't they both have subpeonas hanging over their heads?